Looking for the Right Dentist in Manahawkin? Check Us Out! Finding the right dentist can be tricky. You want someone who is both compassionate and skilled, someone who is interested, not just in your teeth, but in your overall health as well. Indeed, there are many factors you should consider before you commit to a particular dental care provider. We’re happy that, with all the choices in front of you, you stopped by our blog to check us out. We think you’ll like what you discover about Dr. Robert Young, your expert dentist in Manahawkin. Some dentists have a narrow focus. They might specialize in just a handful of treatments, and they’re very good at what they do. Dr. Young is an excellent general dentist, but he has also committed himself to mastering the procedures that many other dentists aren’t qualified to perform. For example, he is an oral surgeon who can install dental implants. In addition to general and restorative services, he also offers smile makeovers. Whether you need a professional whitening treatment, porcelain veneers, or full-mouth reconstruction, Dr. Young wants to help you have a healthy, beautiful smile. We’re not just talking up Dr. Young for the sake of it; he has extensive credentials that include memberships in several prestigious organizations. You can check out his biography to learn more. Dr. Young, as well as everyone else here in our office, understands the importance of social responsibility. The doctor even spent some time on the island of Truk as part of a global dental outreach program, where he helped countless individuals improve their oral health. He values the local community as well; he has been in the area for many years and works with local hospitals to treat those who are in serious need of dental care. When you come into our office, you’ll notice that we are eager to make you feel comfortable and welcome. 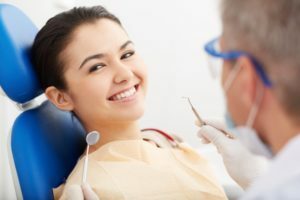 For patients who get a little (or extremely) nervous when it’s time for treatment, we even offer sedation dentistry, which takes the edge off anxiety and helps to create a positive, painless experience. The last thing you want is a dentist who is stuck in the past. That’s why we use cutting-edge technology to protect and improve our patients’ oral health. For example, we use DIAGNOdent Cavity Detection, which uses a laser to catch tooth decay in its earliest stages. We also use ViziLite to spot oral cancer before it reaches a critical point. Gum disease is a serious concern for adults in the U.S., which is why our use of technology extends to a special computer program that tracks our patients’ gum health and catch this condition early on. It may thereby help to prevent the complications that often come with periodontal problems. Are you looking for a highly skilled, compassionate dentist in Manahawkin to look after your pearly whites in 2018? Please come visit us. We’re eager to meet you! If you are interested in learning more about Dr. Young, his practice, or our team at Young Dentistry, please get in touch with us at 609-597-1830. Comments Off on Looking for the Right Dentist in Manahawkin? Check Us Out!